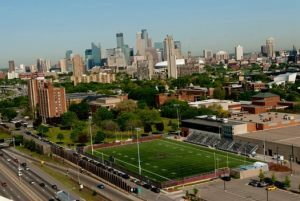 Augsburg University is committed to participation as a contributing community member in the neighborhood we call home, Cedar-Riverside, and in our vibrant city. The Sabo Center stewards this commitment by leading Augsburg’s university-wide place-based work and anchor institution strategy, as well as serving as the touch-point for community-based learning in Cedar-Riverside and Minneapolis. The Sabo Center leads Augsburg’s university-wide commitment to place-based community engagement. Long-term and integrated across the university, we partner with people and organizations in a defined geographic area in and around Cedar-Riverside, connecting students, faculty, staff, and residents through partnerships and projects while focusing equally on community impact, university outcomes, and student learning. Guided by principles of equity and reciprocity, this work involves building and maintaining relationships with community organizations and leaders, and connecting Augsburg with the neighborhood through Sabo Center initiatives such as Campus Kitchen, Cedar Commons, community-based learning, and projects in the Augsburg University Cedar-Riverside Neighborhood Initiative. The Sabo Center is a member of the national Place-Based Justice Network, a group of twenty member institutions that participate in annual summer institutes, continuous learning opportunities, leadership retreats, and other activities focused on place-based community engagement in higher education. As an anchor institution, Augsburg creatively uses institutional resources to contribute to the health and vitality of the neighborhoods of which we are a part through strategic investments, local purchasing and hiring, facilities use, and collaboration with groups focused on strengthening Cedar-Riverside. In addition, Augsburg is a participant in the Higher Education Anchor Mission Initiative through the Coalition of Urban and Metropolitan Universities (CUMU). The Anchor Mission Initiative is a cohort of higher education institutions committed to enhancing the economic and social thriving of the communities of which they are a part. Members of the cohort work together to develop tools for implementing, developing, and evaluating anchor mission initiatives. For more about Augsburg’s role as an anchor institution, contact Steve Peacock, Community Relations Director (peacock@augsburg.edu).